Narrowboating is for those who prefer to see the world at a walking pace allowing time to take in the wonders of the surroundings from the comforts of a floating home. Today’s narrowboats are recreational modern versions of the original working narrow boats built in the 18th, 19th and early 20th centuries for carrying goods on the narrow canals dug across central England during the industrial revolution. They are so named because the locks on most UK canals are only 7 feet wide and so can only accommodate especially narrow vessels. The easy pleasures of narrowboats are echoed in their ease of operation. They are steered with a wheel or by a tiller at the rear of the boat, and the speed is controlled by a throttle lever. One of key pleasures of narrowboating is how effortless it is to glide along the backwaters of England, past glorious rolling countryside, through historic and picturesque villages and towns, and stop off when the fancy takes, for some sightseeing, shopping or a pub lunch. Boating authorities such British Waterways refer to all craft built for canals as narrowboats. Although variations such as ‘wide-beam narrowboat’ and ‘Dutch-barge style narrowboat’ can sometimes be heard, the main distinction between narrowboats is that there are the original and replica goods boats and then the modern boat used for leisure and as a residence.Most narrowboats available today for hire and purchase feature fully equipped galleys with gas cooker and refrigerator, bathroom with shower and central heating. Canal cruising is not all laidback pleasures and does require a little agility, as UK canals require at least one passenger to jump off every so often to operate the various locks and bridges. This is not necessary on mainland European waterways where lock keepers take on the role. A towpath runs along one side of a canal and boats can be moored anywhere along its length for free. Typically this is done by hammering a couple of stakes into the ground and tying the boat to them or by used the rings or posts available at occasional official mooring points. A few times a week the boat’s tanks will need to be filled up with fresh water from water points that are located along the canal way. The boat’s fuel tank will hold more than enough for a two week holiday and so will only need to be considered when owning a narrowboat. If the idea of narrowboating seems a little too much like hard work then hotel boating offers even more relaxed pleasures as the boat is helmed by a trained skipper with crew. As well as controlling the boat they will also provide their passengers with tasty home cooked food and cultural and historical and environmental know-how. 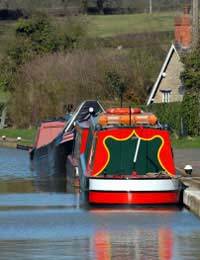 The most popular way to experience the delights of narrowboating for the first time is by hiring a vessel for a week or two week holiday cruise. There are numerous firms offering boat hire throughout the UK and many can be easily found on the internet. A complete beginner will usually be able to handle a large craft with only the minimal pre-voyage demonstration. Canal boat hire firms provide basic info on operating the boat, locks and bridges as well as highlighting the rules of the waterway and safety guideline. Operating a boat is much less complicated than driving a car, as there are fewer controls and as there is speed restriction of 4 miles per hour, everything happens at a much slower pace. Narrowboating is a great way to see the beauty of Britain’s cities and countryside from a new and relaxed perspective and without having to leave the comforts of home behind.